We are about 1 year young and are striving hard to be among top 10 in the twin cities initially and expand to other important cities. Address: Padma Colony, Nallakunta, Hyderabad, Telangana, India. This Broker Profile page for "Gaya3 Real Estate Agency" has been created by PropertyWala.com. 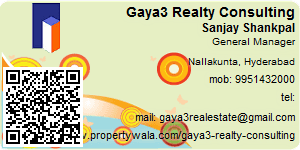 "Gaya3 Real Estate Agency" is not endorsed by or affiliated with PropertyWala.com. For questions regarding Broker Profiles on PropertyWala.com please contact us.